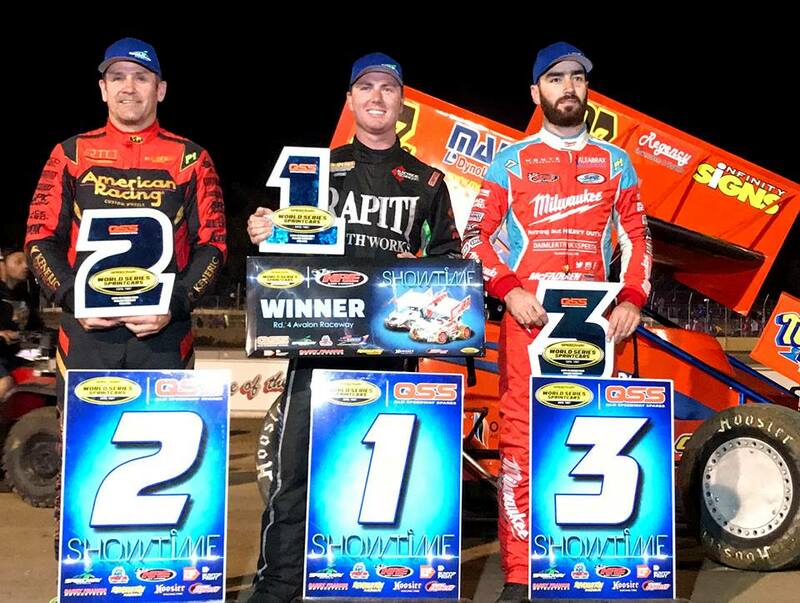 South Australian Matt Egel has claimed his second career QSS World Series Sprintcars win with an impressive victory over Kerry Madsen and James McFadden at Avalon Raceway, Victoria. Egel clawed his way back from time trialling 7th in his flight, but moved forward 5 positions in his heats to make the seventh spot in the Top 8 Shootout, and then timed quickest in all three stages to claim pole position for the A-Main. Despite a great start however, Egel was constantly under threat, with McFadden passing Madsen on the first turn of lap 11 and then Egel in the following straight, before the caution lights illuminated for a spin from Brock Hallett in turn three, allowing Egel to return to the front for the restart. The stoppage would become a curse for McFadden who would never get within striking distance again of the lead pair, as the track rubbered down into a single lane contest. A front straight collision between Shaun Dobson and Brayden Parr with only three laps remaining was the only other incident in the race, and provided some hope to Madsen of a chance to outplay Egel on the restart. The reigning Australian Champion came close on the second last rotation, however Egel never faltered and held on for a landmark win. “This is huge for me and the Downing Brothers. They work so hard and I just had to make sure I didn’t make a mistake because I knew that Kerry and James would jump on it straight away,” Egel said, elated with the win. Kerry Madsen praised Egel’s efforts, revealing that all he could do was wait for him to make a mistake to have any chance of getting past. “He’s a great driver and if he even slipped up once I was going to the stick it in there, but he was too smooth tonight and I’m really rapt for the Downing Brothers, because they work so hard and this win is fully deserved. Egel’s $10,000 win was the first WSS win for the Downing Brothers, and now places him third in the KRE Speedweek points table on 1038 points, with James McFadden leading on 1172 points ahead of Kerry Madsen on 1129. The QSS World Series Sprintcars tour moves onto Warrnambool’s Sungold Stadium on January 1st for the Grand Final of KRE Speedweek, before heading north to Brisbane’s Archerfield Speedway on Wednesday night for the “Sunshine Swing” that also includes the $20,000 to win Australian Sprintcar Open on the following Friday and Saturday.